EgyptAir Flight 804: Egypt Deploys Submarine In Search Of : The Two-Way Egypt's president says the submarine is heading to the area where the plane went down on Thursday. He cautions that determining what caused the crash could take "a lot of time." 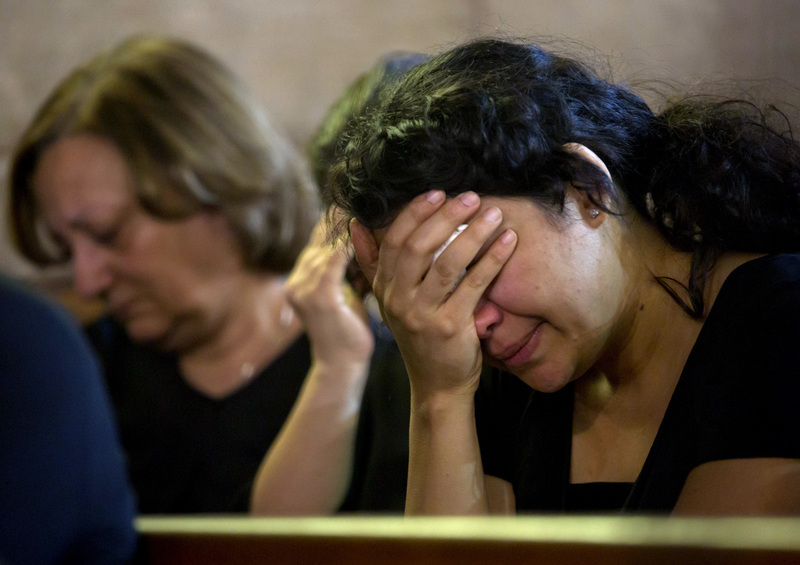 Coptic Christians grieve during prayers for the departed, remembering the victims of EgyptAir flight 804 at Al-Boutrossiya Church in Cairo, Egypt on Sunday. Egypt's president said he has deployed a submarine to the area where EgyptAir flight 804 crashed last Thursday, in an effort to locate the plane's flight voice and data recorders. At this point, there is scant information about what caused the Cairo-bound plane carrying 66 people to go down. "Until now, all of the scenarios are possible," President Abdel-Fattah el-Sissi said in his first public remarks since the crash. "It is very, very important to us that we know all the circumstances that caused this plane to go down," he added. And the flight voice and data recorders are important to that investigation, he said. Sissi said the submarine was deployed from the Ministry of Petroleum, and is able operate about 9,800 feet below sea level. As Reuters reported, "Waters in the area of the Mediterranean under search could be [about 9,800 feet] deep, which would place the black box locator beacons on the edge of their detectable range from the surface." Sissi cautioned that clear answers could take "a lot of time" and urged people not to speculate about the causes of the crash. Egyptian officials have told the families of the crash victims that it may take weeks to conduct DNA analysis of the human remains recovered at the scene to identify their relatives, according to the Ministry of Civil Aviation. The Egyptian military said it found debris from the crash about 180 miles from the coastal city of Alexandria on Friday, including human remains, luggage, and plane seats. They released photos of the wreckage on Saturday. As we reported, French investigators said the plane sent a signal that smoke was detected in the plane's toilet minutes before it crashed. The Aviation Herald released the same data, which was apparently transmitted to ground stations during the flight. Besides a fire, though, the signal could also be caused "by rapid decompression of the aircraft, which can produce condensation that the plane's sensors could mistake for smoke," industry analyst Robert W. Mann told The New York Times. Egyptian officials have previously said terrorism is a more likely explanation for the crash than a technical issue.